This large 10x16 backyard shed features 160 square feet of storage space allowing you to unclutter your garage and become an organization master. The extra-wide 64” double door opening makes navigating in and out easy with lawnmowers, tractors, wheelbarrows and bicycles. The 6’ tall side walls give you plenty of vertical space for long handled tools, ladders and other gardening equipment. The siding is comprised of an engineered wood siding that is completely resistant to the elements. 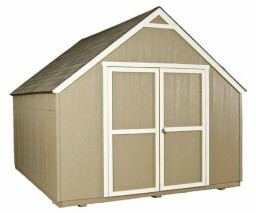 If you’re looking for a spacious, built to last and hassle free storage solution, this 10x16 shed is the ideal choice. This backyard tool shed is one tough storage solution, but there is tremendous customization potential. Try adding a shelf and workbench to make the perfect little workshop. Or, add a window and transform it into a gardening sanctuary or craft room. Double door opening: 64" W | Height: 72"
Your local building authority may have specific requirements resulting in additional cost. Prices do not include painting, staining, permits, zoning and setback advice and/or compliance, excavation, or leveling beyond 6". All prices and content are subject to change without notice. Promotions are valid with online transactions only and cannot be used in conjunction with promotions at a servicing sales/distribution center or distribution center. Not valid on prior purchases. All stated sizes are nominal dimensions and approximate. Some buildings may be shown with optional items. Additional mileage charges (if applicable) and taxes will be calculated after checkout process is completed. Painted 10x16 shed is a representation only, arrives primed for painting in a light beige color. We ordered our shed in April and were contacted with an install date and installer arrived and installed shed and did a great job.Overall very pleased with shed and service. Had install scheduled and no show. No call or anything. Rescheduled (with window and vent thrown in for initial pain) with no show and no call. Then they showed up unscheduled. I don't have problem if truck breaks, it rains, or high wind (all their excuses) but could call so we aren't waiting around. Install was OK, team polite and hard working. However, I gave them $100 for step install and it never happened. I also bought 4 ground anchors at their suggestion and they took them and never installed. So, total of $150 out-of-pocket wasted. All-in-all, the shed is OK for what it cost but very shoddy communication. the sills/plates were plywood, one of the rafters warped creating a roof bump, and that it has no trim boards. The installation team was first rate. A father and two young sons that were truly impressive. I had to add hurricane roof ties after the installation to satisfy the local building inspector. Our shed we use for gardening. Works very well,looks great! It does have rotten wood around the window which is why I didn't give it a 5 star. The installer was very professional a would gladly do business with Shed Liquidators. Thanks. Very happy with my shed. 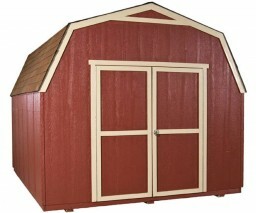 Good value, shed is sturdy. I would recommend getting the flashing option and calk and paint it so it will last. This is obviously not a TOUGH SHED but I don't plan on driving my tractor over my shed. 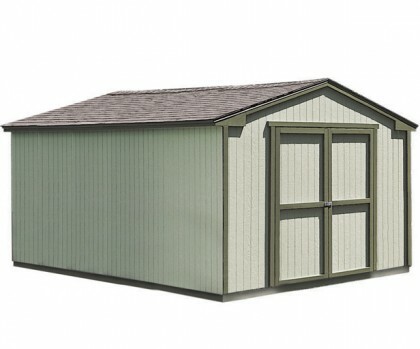 I saved almost $2000 on the same size Tough Shed and $1000 saving on a similar Costco shed. I went and looked at how a Tough Shed was build then went to Lowes and bought $75 worth of 2 x 4s and reinforced my shed the same way a Tough Shed is build. I would bet you can drive your small tractor over my shed now too. I did not mind spending the time reinforceing it or painting it to save $2000 (painting only took me 2 hours). Installers were excellent craftsmen... I highly recommend the shed to others if you want an inexpensive (this will do fine for what I want) shed. The shed is utilitarian at a reasonable price lots of room for storage and shelves, add skylights for additional natural light. Great value, good quality, and great service.! excellent shed to go hide out in away from the Grand kids, Ha,Ha,but anyway has lots of storage for alot of yard equipment. Learn about our storage shed installation process here.